These strong, oversized rings are well suited for bulky loose leaf material, swatches, large signs, or heavy samples. The threaded locking design holds securely, even under heavy loads. 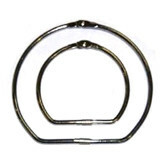 The lock can also be easily unscrewed and the ring reused.